TenFifteen F6 is a new smartwatch in markets, a standalone smartwatch with 4G connectivity. the TenFifteen F6 smartwatch comes with beautiful look, it has a steel alloy body with a silicone strap. having a 1.39inch round AMOLED display protected by a Corning Gorilla 3rd generation glass from shocks and scratches, On the right side, there are two physical navigation buttons with 5-megapixel camera. TenFifteen F6 powered by an MTK6739 Quadcore processor with 1.5Ghz speed and running the latest Android 7.1, the standalone smartwatch also has 1GB RAM, 16GB of internal memory, which is enough to download many apps on your smartwatch. 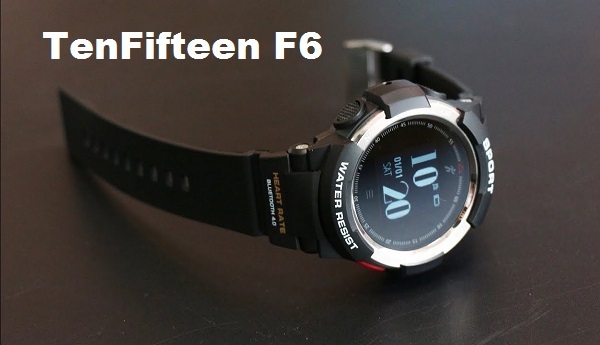 the TenFifteen F6 watch phone has several of features you need, there are Bluetooth 4.0. GPS, GLONASS, WIFI, pedometer, heart rate monitor, remote, browser, Play store, calendar, clock, Camera, Gallery, Maps Find my device, health, weather and more. 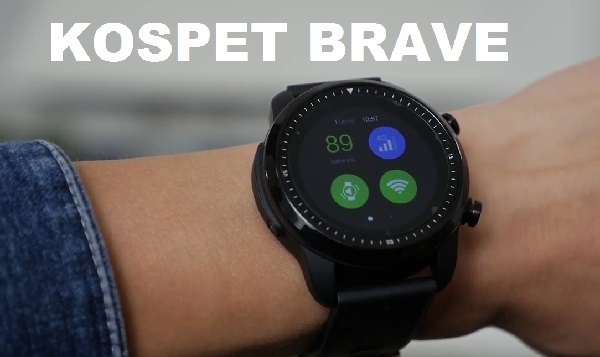 KOSPET BRAVE, a new Android smartwatch for less than 150$, the smartwatch comes with a stylish look and has many features and huge storage space. let check the specs of KOSPET BRAVE 4G smartwatch. Design:Kospet Brave watch phone comes with classic fashionable look with detachable watch strap, and available with black color, it has a 1.3 inch AMOLED screen with 240 × 240 resolution and support multi-touch screen, in the side there is two physical navigation buttons as well as a speacker, but there is no camera. Specs: The standalone smartwatch powered by an MTK6737 processor with 1.2 GHz speed and running the Android 6.0 O.S. it has 2 GB of RAM with 16 GB of storage space, so you can download any app from Playstor without worry about memory full. An other new Android standalone smartwatch is here, but this time with huge capacity 3GB RAM and 32GB ROM as well as 4G connectivity. the new smartwatch calledLOKMAT LK08. Design:LOKMAT LK08 Android smartwatch comes with sporty look and classic as well, having a round shape with its classic design . on the side, there are two physical buttons with 5.0MP Camera. While the screen is 1.39 AMOLED with 400*400-pixel resolution as well as an IP67 waterproof rating. Specs:The standalone smartwatch powered by an MTK6739 processor with 1.25GHz speed and running the latest Android 7.1. it has 3GB of RAM with 32 GB of storage space,and users are allowed to install their favorite applications from Play Store. Standalone smartwatch is the best website about Android smartwatches, Wear Os smartwatches, 3G smartwatches and 4G smartwatches. FINOW X7 is another new 4G Standalone smartwatch with sim card supports, the watch comes with an amazing look and has many features and functions that make it like the powerful smartwatches. 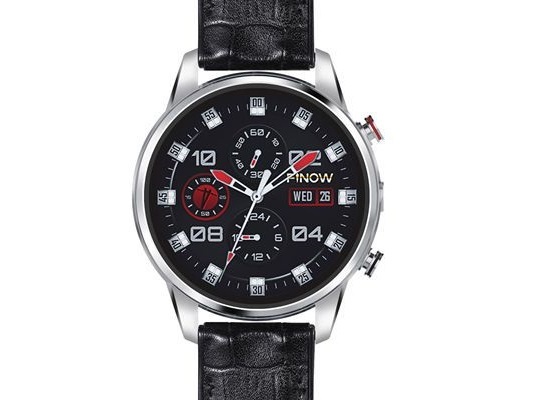 Design:FINOW X7 smartwatch comes with classic fashionable look, it has a Stainless Steel body with TPU Leather strap. on the side, there are two physical buttons with 2.0MP HD Camera. While the screen is 1.39 AMOLED with 400x400 pixels resolution. Specs: The standalone smartwatch powered by an MTK6739processor with 1.25GHz speed and running the latest Android 7.1. it also has 1GB of RAM with 16 GB of storage space, so you can download any app from Playstore without worry about memory full. Connectivity: FINOW X7 is a standalone smartwatch supports 4G connectivity with its nano-SIM card slot, you can make phone calls and send messages on your smartwatch, additional connectivity includes WIFI, GPS, Bluetooth 4.0. 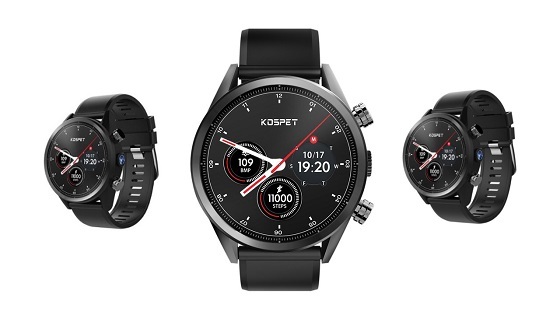 Kospet is a new brand in smartwatches world, however, they made three of the best android smartwatches with sim card, Kospet hope then Kospet Lite and the latest one is kospet brave. let check the features of these three smartwatches. This is the first smartwatch that has 3GB RAM and 32GB ROM, Kospet Hope smartwatch has a circular design with a silicone strap. The smartwatch has two physical buttons for navigation and on between is a camera with 8.0MP resolution. having a 1.39inch AMOLED display, 400*400 pixels resolution with touch screen supports. 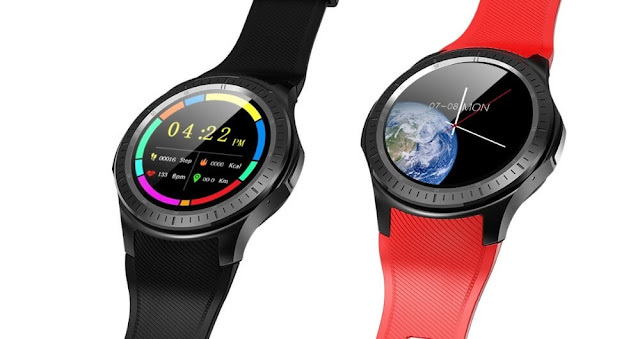 The latest Android smartwatch is here, LEMFO LEM9. a 4G LTE smartwatch with new look and design and with more features such as 5 days of standby time. Design:LEMFO LEM9 smartwatch comes with sporty look, it has an aluminum bezel with TPU strap. on the side, there are two physical buttons with 5.0MP front Camera. While the screen is 1.39 AMOLED with 454*454-pixel resolution as well as IP67 waterproof rating. Specs:The standalone smartwatch powered by an MTK6739 processor with 1.25GHz speed and running the latest Android 7.1. it also has 1GB of RAM with 16 GB of storage space, so you can download any app from Playstore without worry about memory full. Makibes AT06 Android 4G Standalone SmartWatch 2019 If you are looking for new Android standalone watch with an affordable price, Makibes AT06 is a good choice. The Makibes AT06 is a new 4G smartwatch with sim card, GPS, WiFi, 16GB ROM plus the affordable price. Design: Makibes AT06 smartwatch has a sporty look with its round shape and a silicon strap that is available in black and red colors, on the side, there is a speaker but no camera. it has 1.3 inch IPS display protected by 9H glass corning gorilla 3rd generation with 320 x 320 screen resolution. Specs: The New Android smartwatch is equipped with quad-core processor MT6739 and running Android 7.1. It has 1GB of RAM with 16GB of storage space, which is enough , and users are allowed to install their favorite applications from Play Store. a new standalone smartwatch is here, the LOKMAT LOK 02. The device is a 4G smartwatch with sim card, Dual HD Camera as well as a unique design. Design: LOKMAT LOK 02 smartwatch has a classic look with its round shape and zinc alloy bezel as well as a silicon strap, on the side, there is a speaker with 5MP Dual HD Camera. it has 400*400 pixels resolution with 1.39 inch AMOLED HD Color screen protected by a Corning Gorilla glass. Specs: The New Android watch is equipped with quad-core processor MT6739 and running Android 7.1. It has 1GB of RAM with 16GB of storage space, which is enough , and users are allowed to install their favorite applications from Play Store. KINGWEAR KC05 is another new smartwatch with an affordable price 109$. an Android 7.1 smartwatch with GPS, Bluetooth and 4G LTE connectivity as well as IP67 waterproof rating. Design: KINGWEAR KC05 4G smartwatch has a classical look with its round shape and a silicon strap, on the side,there are two physical buttons with a 8MP camera. it has 400*400 pixels resolution with 1.39 inch AMOLED display supports touch screen operation mode..
Specs: The standalone watch is equipped with quad-core processor MT6739, 125Ghz and running Android 7.1. It has 1GB of RAM with 16GB of storage space, which is enough , and users are allowed to install their favorite applications from Play Store. 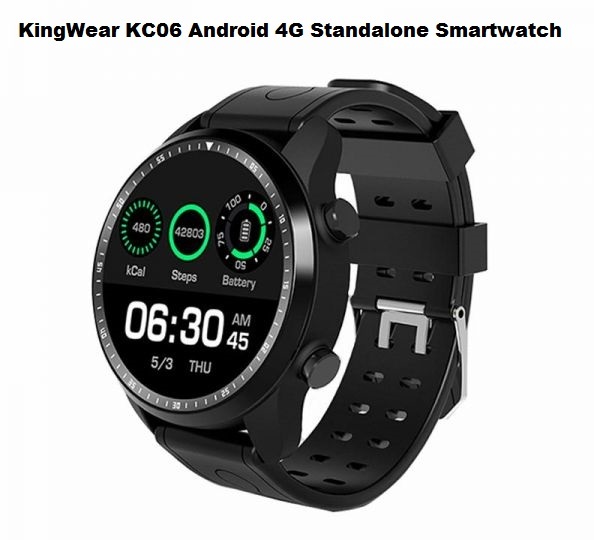 KingWear KC06 is an other new Android smartwatch with sim card supports, the smartwatch comes with beautiful design and many features such as 1GB RAM, 16GB ROM and IP67 waterproof. 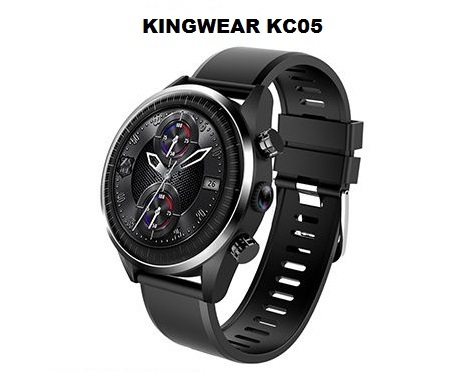 Design: KingWear KC06 smartwatch has a fashionable look, which is classic and sporty as well, having two physical buttons on the side, but there is no camera. it has 1.3 inch AMOLED capacitive display with 360 x 360 screen resolution and powered by an IP67 waterproof rating but not suitable for swimming. Specs: The New smartwatch powered by an MTK6737 processor with 1.2GHz speed and running Android 6.0. it has 1GB of RAM with 16GB of storage space, which is enough , and users are allowed to install their favorite applications from Play Store.